A chain of strange and sorrowful events is set in motion in the French town of Beauval when lonely 12-year-old Antoine Courtin angrily whacks his adoring 6-year-old neighbor, Rémi, in the head with a branch—and, to his great shock, kills him. The incident takes place in the woods, where Antoine was fuming over the shooting and heartless disposal of Remí's dog by the boy's father after it was struck by a car. Gripped with the fear of being thrown in prison with vicious murderers, Antoine pushes Remí's corpse into a deep crevasse, runs home, and waits for the police to come and arrest him. That they only want to question him about the boy's disappearance leaves him no less panic-stricken. When twin cyclones hit the provincial town, ripping roofs off homes—and threatening to expose Remí's body—the natural world itself seems incited by the killing. Flash forward a dozen years, and Antoine, never nabbed for the crime, has settled into a "normal" life as a doctor who is engaged to be married. But the curse of Beauval strikes again after he sleeps with a local woman, the love object of his youth, and she demands that he marry her. A short, delirious novel, this latest effort by the author of Alex (2013) and Blood Wedding (2016) may remind some readers of the macabre scenarios of Alfred Hitchcock Presents. 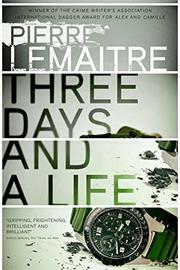 No one is writing quirkier thrillers than Lemaitre, who gets inside the head of his unhinged protagonist with wicked delight while capturing the madness of the modern world. French favorite Lemaitre's novel, about a preteen on whom fortune smiles in the most devious ways after he accidentally kills a little boy, is a feverish, wickedly entertaining work.